I know it doesn’t feel like it to many of us, but spring is coming! The first day of spring is less than a month away & before you know it, we will be packing away our coats & snow boots for rain jackets & sandals. Today, I am talking “shoe shopping” on the blog with some of our favorite picks for the spring season! (Make sure to read the whole post because we have a great giveaway at the bottom of the post!) With three young children, I have finally decided a system for shoe shopping so I maximize my purchases & make sure the shoes we buy get wear! With spring upon us & a new season of buying shoes, I am sharing some of my tips and tricks to shoe shopping for children. 1. Get your child’s foot measured each season. Take them into a store you know and trust to get their feet measured. 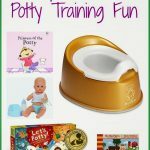 I also have several friends that have used this product & recommend it. 2. Decide what shoes you need for the season & stick to your list. It’s easy to overbuy with shoes (especially with all the unlimited adorable options), but if you stick to your list then you will make sure those shoes get their wear and you get your money’s worth! 3. Watch for spring shoe sales & stock up. 4. Make sure you buy shoes that last and are comfortable to your child. 5. Let your child help pick the style! I have learned to find shoes that my kids really like & you will have no problem getting their shoes on everyday before you leave the house. 6. Find shoes that your child can put on & take off themselves. I always buy my little ones velcro or slip on shoes, because lacing shoes would be one more thing that we would have to do to get out the door! 7. Make sure to find shoes that are easy to clean. I often will throw sneakers & sandals into the washing machine, if possible, to get a quick clean after some really “messy” days outside! 8. Don’t be afraid to spend a little more. You can buy kid shoes everywhere & for a wide range of prices. I have found that you pay for quality so make sure that you buy shoes that will last or else you will be buying pair after pair after pair. On my list for the spring season, I try to find the following types of shoes for my kids: sandals, sneakers, “dressier” shoes, & rain boots. 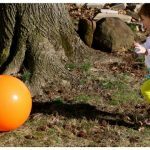 I am sharing some of my favorite finds for spring from one of my go-to shopping shoe shopping stores for kids, Stride Rite. 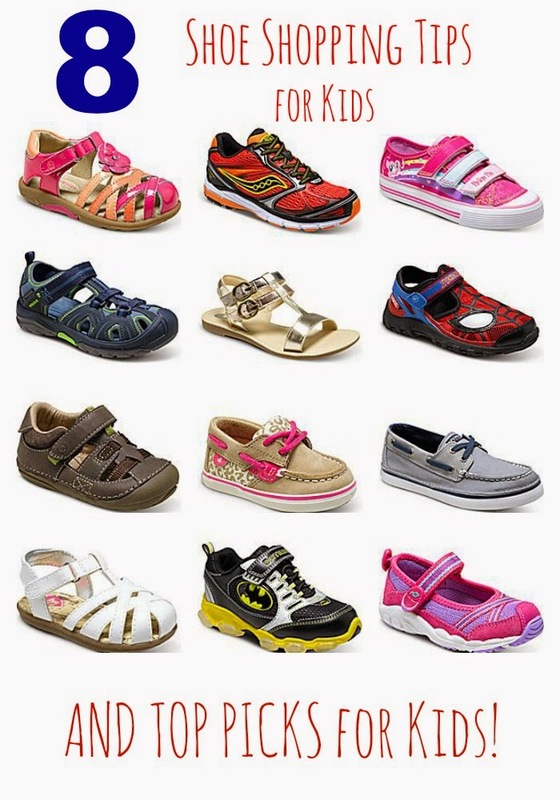 Stride Rite has a huge inventory of shoes for children of all ages & there is really something for everyone. Not only do they feature their own Stride Rite brand, but Stride Rite carries other brands including: Merrell, Saucony, Sperry, & more. Their shoes have great prices & quality for all the children in my family. 1. Sandals: I look for sandals that I know can survive beach weather, playground play, & running through the backyard. If they don’t, then those are not the sandals for me. Then, I decide what my child will wear. Knowing that my four year old is super into Spiderman, it was an easy choice when I saw the Stride Rite Spiderman sandals! These light-up shoes are actually called “shandals” which give the support of a shoe, but a feel of a sandal for my son! 2. Sneakers: I look for sneakers that will last & satisfy my child’s needs. My oldest son in kindergarten wears sneakers everyday to school so I need ones that will really last through school days as well as after school play & sport practiced. His Stride Rite pair from the fall have lasted well & so I was excited to find a new pair of sneakers in bright colors fro spring. And he loves his new, bright Stride Rite sneakers! For my little one, Abby, I was looking for a supportive sneaker that would be good for the playground & running around town. Of course, when I found these adorable Abby Cadabby shoes, I knew that these were the perfect sneaker for her! 3. “Dressier” Shoes: I try to find one “dressier” shoe for my kids each season. These are shoes that they can wear for church, pictures, & any other moment when they need to “dress” up! Again, I look for shoes that will last through the season and be comfortable for my child. Knowing that my boys’ loafers still fit from this winter, I chose the Stride Rite fisherman sandals that will match with anything & be comfortable enough that my boys won’t fight me to put them on! 4. Rain Boots: Last, my kids LOVE their rain boots. They wear them daily around the house & love splashing in the puddles on rainy days. I look for bright colored, fun boots that the kids love, like these fun finds from Stride Rite! And now for the giveaway! 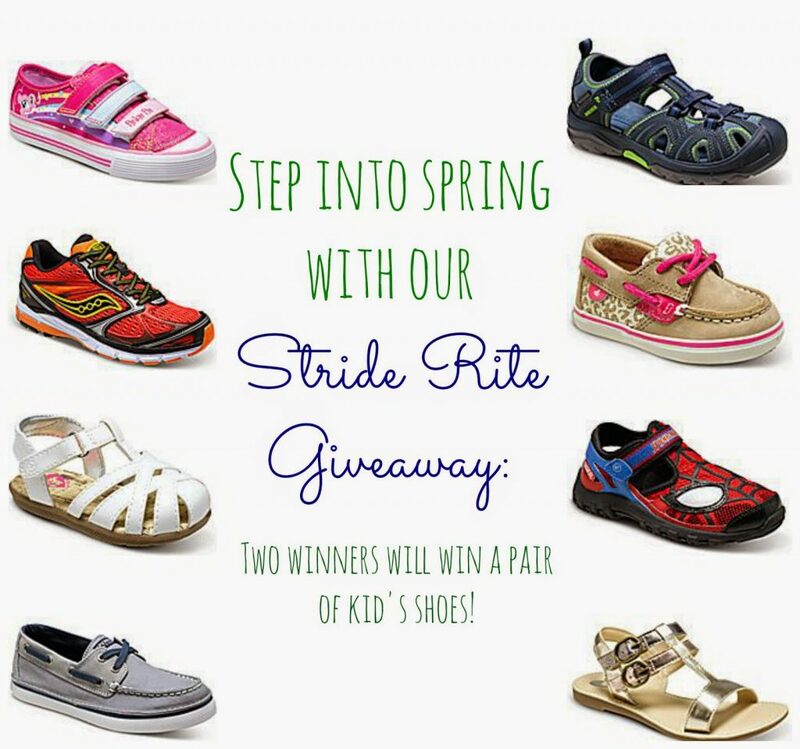 Two lucky winners will each win a pair of shoes from Stride Rite (up to $50 value). One winner will win a pair for girls while another winner will win a pair for boys. Enter in the Rafflecopters below & good luck! 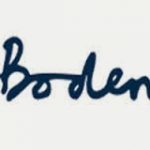 Spring into Style with Boden (and Giveaway)! Stepping Into a New School Year! Would love to win! 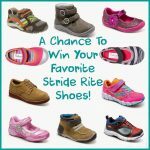 Stride Rite shoes are the best, especially since my son has very wide feet and is hard to fit! Love the Lil Nandini Crib shoes! As a Mimi, I always buy Stride Rites! My Mom bought them for me & my children and now I buy for my Granddughter. Would love to win a pair for Spring! Thank you for the opportunity! Made to play sandy or Nikki!! The Baby's Stride Rite Dalis are adorable! My little one is so close to walking. I'd love new shoes for him! My Son would love the Spiderman shoes! I love the hudsen sandals!! My twins love shoes that light up, so I think the Spider-Man shandals would be a big hit with my son. The Ariel lighted mary janes would be perfect for my daughter. I love your Kid's Merrell Chameleon Mid Lace Waterproof shoes. Our Granddaughter has Hypotonia and her specialist said she needs to wear high cut sneakers/shoes to support her weak ankles as she walks on the insides of her feet. It's either wear them or she'd need to be fitted for SMO's. The shoes, I mentioned, especially being that they're waterproof, would be awesome!! I love the Made 2 Play Sandy style. I'd love one in each color! They're all so cute! I like the Kid's Stride Rite Disney Ariel Lighted shoes. I like the Kid's Stride Rite Disney Cinderella Lighted for my daughter. I like the Girls Stride Rite Colette in leopard! Adorable! Love all the sandals you included for little girls! http://www.striderite.com/en/marvel-spider-man-lighted-shandal/12580B.html?dwvar_12580B_color=BB45612#cgid=boy-shoes-sandals&start=1 My grandson would adore these! I'm loving the Sperry Top Siders! I love the Poet and Nandini sandals! Love the Aria sandals for E, but both kids get Merrell Waterproof shoes. Great quality and easy for on the go. I'm loving the Stride Rite SRT Greta for baby girls! Btw, I like the new facebook share option of tagging friends in the post- that way I can share with those who would be truly interested and not spam others' newsfeeds. Thanks! Love stride rite shoes. My son would be in heaven if he got the spiderman sandals! I like the Dalis runners. I would love to try some sandals for my son. My favorite are Baby's Saucony Jazz Hook & Loop. We like the Kid's Stride Rite Sugar & Spice Pepper. Love the propel a/c for spring adventures when it can still be cool out and wet. I love the Baby's Stride Rite Nandini! I like the sparkly Quinn shoes. The slection overall of the footwear is amazing!! I love the Stride Rite Sloane. My daughter would love these too. 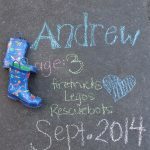 Stride Rite is Perfect for my daughter with wide feet! I completely love the Kid's Stride Rite Marvel Spider-Man Webbed Wonder!! My son would love them too! Kid's Stride Rite Disney Frozen Anna & Elsa shoes are so cute !! Oh he would love the Kid's Stride Rite Marvel Spider-Man Webbed Wonder! So cute for Spring! Would really like the fisherman sandals for my son. I would love these Baby's Stride Rite Made 2 Play® Reagan for my daughter. I really like the Stride Rite SRT Preschool Jasper. My son is Spider-Man obssessed and he would love any style the wonder, web or even th flipflops. I like the Kid's Stride Rite Hudsen . I love the Baby's Stride Rite SRT Lily! Adorable! !